My husband and I recently celebrated our 30th wedding anniversary, so this is my stone sculpture tribute to love. I never thought I would make a monument to love, but I surprise myself. The past 30 years have been an awesome adventure! I grew up with the Eastern Bluebird in upstate New York (the state bird.) I met the Western Bluebird when I lived in California for 23 years. Now I have the pleasure of the Mountain Bluebird in Colorado. Seeing bluebirds is a comfort, an instant tension release. The pressures and concerns of the day fall away in great cascades when I see them. (The sliver moon, both new and old, has the same effect.) I can’t explain it, I just feel so much better in the company of these visions. The bluebirds are carved from Andean Blue onyx, a semi-precious gemstone known to exist only in one place on earth: 13,000 feet up in the Andes Mountains of Argentina. The stone is both clear and clouded and one can peer inside to see transparent layers of blues and greens—it is a deep vision, like looking through time. Blue Onyx is very tricky to carve as it can break on all the color changes. One never really knows how much pressure can be applied to the stone before it will come apart. Mysterious in many ways. Color is a fun aspect of my work, and I enjoy combining stones that compliment each other. 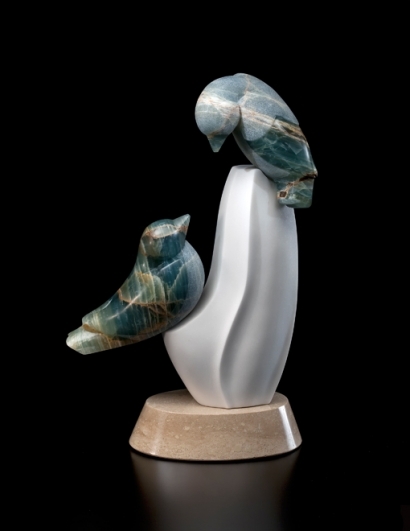 The birds perch on an abstract tree-form carved from Sivec Marble from Greece. This marble is fantastic to carve—very trustworthy, and the crystal is beautiful when finished to a very low grit (like 120). There is no bedding plane, so the stone is hard and strong in all directions. There is no vein in Sivec so it provides a perfect stage for the opulent bluebirds. White marble bends light and shadow, blue onyx absorbs it. Many thanks to Brian, my husband, for acting as drill assistant–five pin holes and much creative problem-solving–one of my more challenging assemblies.